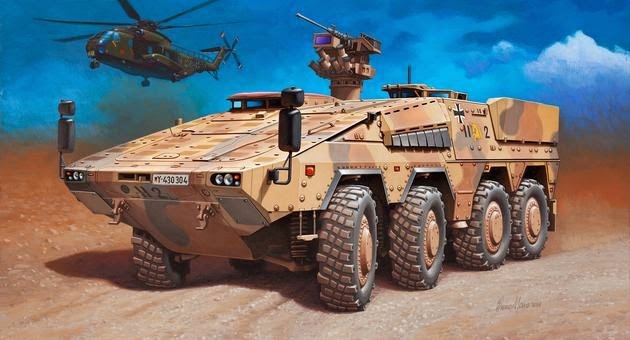 Revell released it's latest piece of modern armor, the GTK Boxer GTFzA1 APC (Kit No. 03198) two days ago so let's have a look at what is in the box! You find 7 sprues with 107 parts. Usually quite a lot of parts are reserved for the chassis in these type of vehicles but this one also has a very large amount for the super structure. One sprue has clear parts for the drives hatch, their also is a basic interior for the drivers compartment. Usually the thread pattern of the wheels is a weak part in injection moulded kits. Revell actually builds the wheels from 3 'disks' instead of two on this model to overcome this problem. The underside of the main body and the 'inner wheel disk' providing extra thread pattern detail on upper left corner of the photo. Rear and upper part of the roof, again the bolts and anti-slip surface giving these sort of vehicles their distinct look are very well done. Frontal part of the roof, very good detail here. This looks like a nice model to build and paint with very good detail. You can choose between the standard NATO three tone camouflage of a dessert themed three tone camouflage.